The beauty of the landscape is easily recognizable to most. Whether the sun is shining or rain is falling all our senses are tuned in during the day. For those of you privileged to see and enjoy this beauty at night know why I can be so passionate about Outdoor Lighting. Lighting as a whole provides, beauty, usefulness,safety, security and emotion. The possibilities seem endless. All this is inherant in a great nightlighting design. However, beauty seems to what comes to mind more often than not. The aesthetic view of lighting at night connects with the mind and at times can never be forgotten. Fundamentally light deﬁnes space at night and is an enabler to view the world in darkness. A good outdoor lighting design plays harmony amongst the hardscape, greens cape and architectural elements all making up the landscape. These seem to be the vital cords in composing a pleasing and unforgettably beautiful night time scene. When night lighting is perfected on the premises, the inside of the home becomes connected to the exterior attributes of the home. This feeling of extension brings tremendous enjoyment to the family in many ways. Beauty at night sounds confusing? Well to the homeowner, contractor or electrician it most certainly is. 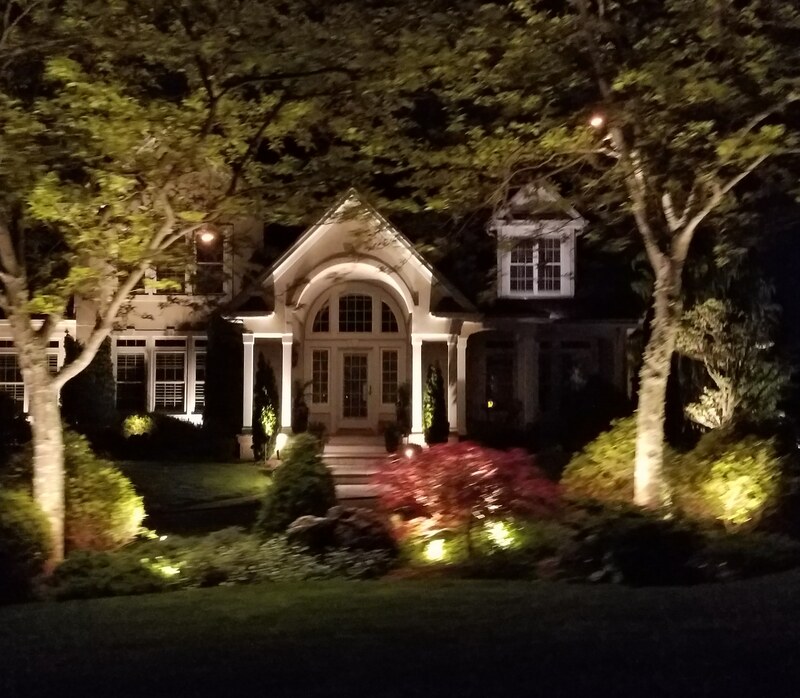 The ﬁrst step is to contact a lighting specialist–one who recognizes the plant materials and hardscapes at hand and is experienced enough to know what to light and how it should appear lit at night. 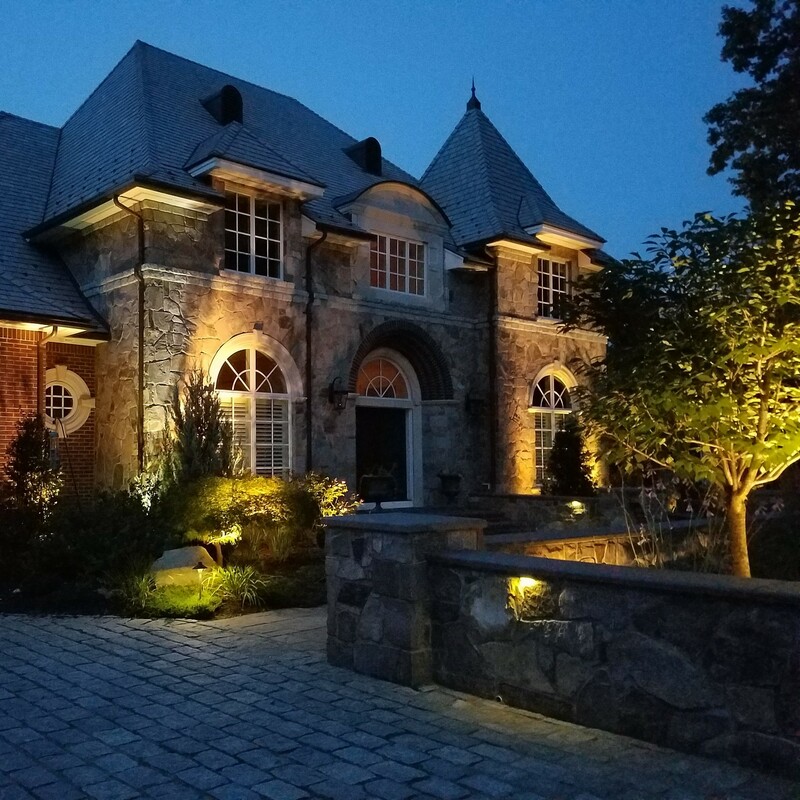 An Outdoor lighting designer understands the illuminance composition necessary to bring just the right amount of light to the scene to see it appear lit at its fullest beauty. This may mean bringing light to plant materials, hardscape surfaces, sculptures or focal pieces all inside the architectural elements to complete the night time scene. An electrician offers strengths and technical know-how, but falls short when it comes to this type of landscape lighting portrait. Landscape lighting does not play a role in the technical aspect. Outdoor landscape lighting is an aesthetic art form. There are many lighting rules which apply to the conceptual outdoor lighting design. Smaller parcels diminish light glare and pollution for the neighbors. Overuse of horizontal fixture types creates a landing strip appearance. The lighting design should have no dark holes. 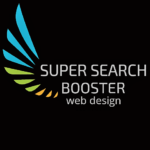 There should be lighting connectivity and composition throughout the design. Equal brightness of focal points surrounding architectural elements needs to be considered. Brightness levels need to be illuminated with connecting lower levels of illumination. The points of view need to be identified. These, and other lighting conceptual concerns, are presented and discussed individually in an effort to establish a master lighting plan for the property. The Outdoor lighting Design plan can be implemented in phases do to finances, time constraints, and desires of the homeowner. A professional outdoor lighting design brings the landscape to the fullest, 8 seasons, 4 seasons both day and night. Perhaps its time you considered seeing your landscape at night? If so, Michael Gotowala Principal designer of Preferred Properties Landscape Lighting can help. Gotowala’s award winning lighting strategies have earned him top rank amongst landscape lighting and Outdoor Lighting designers alike.